I’m extremely pleased to see that after months of efforts and contributions by different people around the world, Postgres-XL 9.5 R1 Beta1 has finally arrived. This release is significantly better, in all respects such as performance, stability and high availability, as compared to the past release. 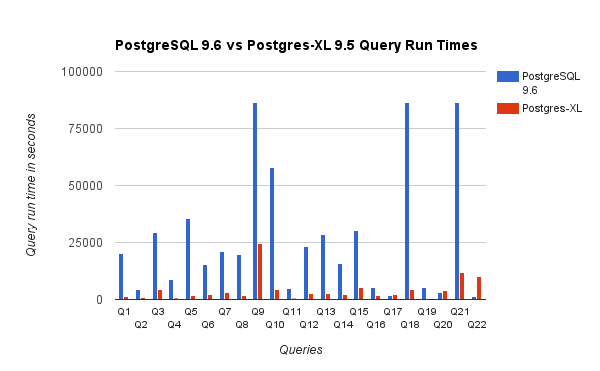 Enormous amount of work has gone into PostgreSQL in the last few years and majority of that is now available in this release of Postgres-XL 9.5R1 which is based on the latest PostgreSQL release. If you’re looking for a PostgreSQL based technology that can support terabytes of data, massively parallel processing, supports OLAP and OLTP workloads, offers a consistent view of the entire cluster and is compliant with PostgreSQL as far as client APIs are concerned, have a look at the latest Postgres-XL 9.5 R1 Beta1 release. If you find bugs, please report them to [email protected] For more information, please visit here. Postgres-XL community is committed to enhance and support the technology for many years to come. At the same time, Postgres-XL community will work towards getting many of the advance features back into vanilla PostgreSQL so that one day PostgreSQL has all features built into it. This is not an easy task, but we are committed to it and I’ve no doubt that with the help of our vibrant, wider PostgreSQL community, we will get there. Let me leave with you with some performance charts that we plotted for TPC-H and pgbench benchmarks. They will be discussed in detail in a future blog spot, but the graphics clearly indicate the results. /wp-content/uploads/2019/04/2ndQuadrant-Logo-e1554357894467.png 0 0 Pavan Deolasee /wp-content/uploads/2019/04/2ndQuadrant-Logo-e1554357894467.png Pavan Deolasee2016-02-18 18:44:012019-03-01 07:41:20Postgres-XL 9.5R1Beta1 is here! Fantastic work. Looking forward to interacting with some real systems running the 9.5 Postgres-XL.